Our vision: To see the people of our community reconciled to God as the lost are reached, the hurting renewed and relationships restored through the power of the gospel. We are committed to loving God and loving people in our community. 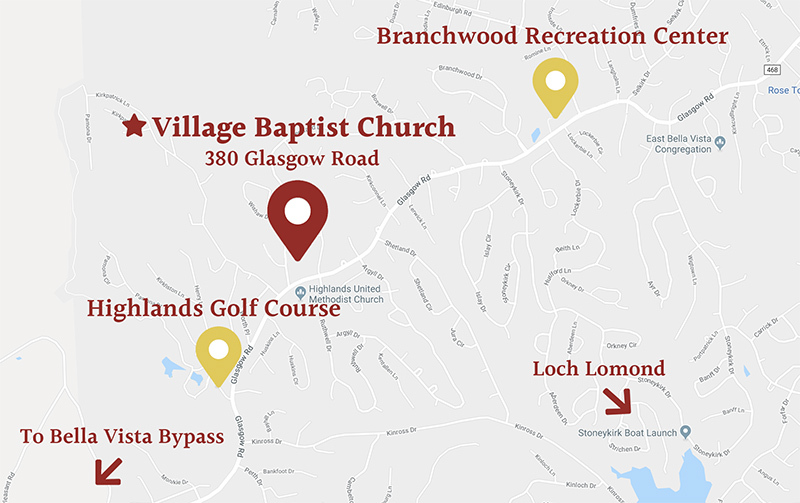 We are a church rooted in movement, and although we worship weekly inside of our church, the members of Village Baptist Church meet God and other people in many places throughout the week. Jesus trained his disciples while ministering in their communities. Shaping followers of Christ for Village Baptist Church is not information based only, but also obedient-based as we live out Christ’s commands in our community. Join us to discover how reach, renew and restore unfold as discipleship in action. We do this in practical ways: small groups, teams, Bible Study, music and worship. Come discover how you can grow in your relationship with God and others. REACH: We encourage every person of Village Baptist Church to be involved with reaching others to the extent of their ability and gifting. Reaching others with the good news of God’s love and forgiveness is motivated by God’s enormous love for all of us. Everyone is equipped to share Christ with others through a simple and natural presentation of the gospel. RENEW: We all need new beginnings. We face times when we must work through a challenge or adjust to a new normal. A new beginning starts with the hope of renewal. We provide training and networking, so that individuals can discover solutions for life’s challenges and minister to others in their time of need. RESTORE: We all need God’s grace and forgiveness in our personal lives to restore broken relationships. This begins by experiencing God’s reconciliation. Through the application of God’s Word, seminars, workshops and training, we empower individuals to restore fulfilling relationships with God and others.